The Never-Ending Awesomeness of a Never-Ending Card! Snail mail people are a creative bunch of folks! 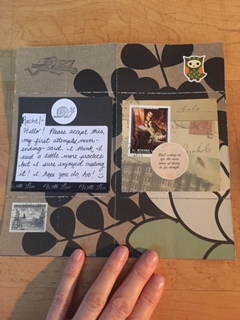 I recently took part in a fun postal swap...creating a never-ending card. I had never tried to create a never ending card before but... you know what they say..."Never say never!!" Except when you're describing this card that seemingly never ends, I guess?? Thanks to the magic of the wonderful, worldwide web and super crafty folks who share their skills on YouTube, I was able to follow a tutorial and make my own. It was a fabulous time of never ending, crafty, postal fun! 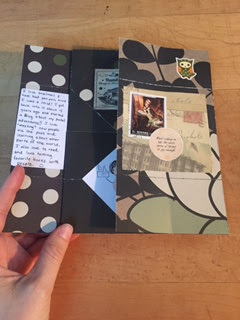 Snailmail is such a wonderful hobby! Not only can you unleash your creativity with cute, clever cards and lovely, long letters but you can send them to your friends and most likely get something equally wonderful in return. You send. You receive! It's a never ending cycle of magic!! Have you ever heard of the rule of multiplication? It is something like... the probability that events A and B both occur is equal to the probability that event A occurs times the probability that event B occurs, given that A has occurred. I'm not completely sure what that means but I'm positive that if I send mail (event A) the probability that I will receive mail (event B) is very great! In fact since I started my mail more magic postal project, I've had so much happy mail! I've even had some spontaneous mail from folks that have just heard about my love of all things postal! Just today I received a hand written note and a fascinating article about receiving mail on the trail during a bicycle adventure. This note and story made my day!! Thank you so much, postal pal! I encourage you all to continue your quest to mail more love. We really can stamp out despair one letter, postcard, note, card and package at a time! Send more mail, people. It's mathematically proven to be magical!